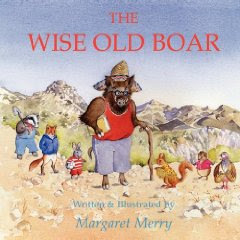 Of all the three books we read from this author, The Wise Old Boar was the one my children and I enjoyed the most. We thought it funny and laughed out loud during several scenes, delighting in the situation in which the old boar gets stuck. The story is about a boar who pretends to be wise and enjoys playing the role of wise counsellor, making up ridiculous but imaginative advice to give to the animals who come asking for it. None are the wiser until an event occurs that exposes the boar for what he really is. But all is not lost when he saves the day. As with all of Margaret Merry's books, I also had to read this one in two sittings because it was too long to read in one (68 pages). Perhaps the story could be divided into chapters? As usual, the author's colorful water illustrations are delightful and bring added life to her stories.